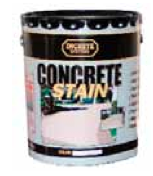 Looking to buy Concrete Stain-Sealer by Increte Systems in Rochester NY, Ithaca NY and Western New York? With an A+ reputation for customer service and prompt pick-up and delivery, the Duke Company proudly carries the full line of Increte Stamped Concrete System products. Widely respected solvent-based stain sealer. Advanced engineering has formulated the product with acrylic resins engineered to provide extensive penetration for all concrete and masonry surfaces. Widely respected by professional, decorative concrete contractors for its durability and ability to stand up to high traffic. The Duke Company carries convenient 1 gallon pails and 5 gallon pails, for pick-up and delivery in Rochester NY and Ithaca NY.